We gather you know today is Friday the 13th where some people believe its the day for bad luck. We wish you some good luck today for this drop from Vincent Scala! 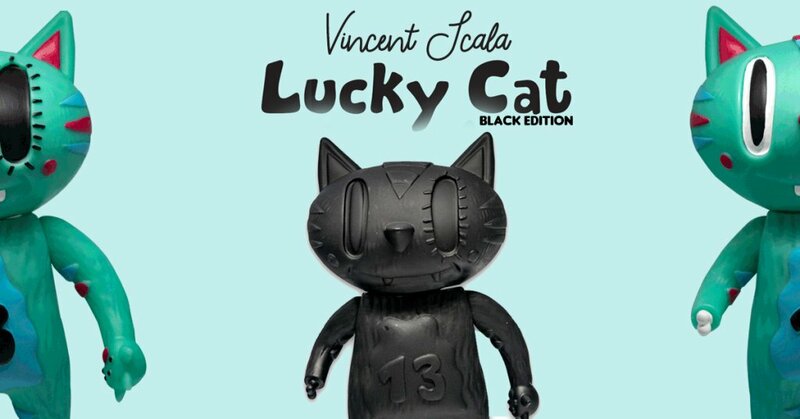 As you may recall Vincent Scala’s Sofubi Lucky Cat from last year when Vincent ran a successful Kickstarter campaign to bring Lucky Cat to life. Lucky Cat has turned into Black Lucky Cat, in time to ward off all the bad luck (that’s the theory) The unlucky part is, there are only 13 of these cats available for purchase. Lucky Cat 8″ Vinyl Toy. Packaged in Clear Plastic Bag with Header Card. WHEN: Friday 13th 7pm EST. Need the OG Lucky Cat? You’re in luck! Vincent has his new Skeleton Racer sofubi figure available in limited numbers. Priced at $25 each and come in a clear sofubi vinyl. Please feel free to check out Vincent’s website: www.vincentscala.com for further info.